The Swiss born Jura has been producing high-end appliances for the home since 1931. As a pioneer in the espresso machine industry, Jura teamed with Capresso in 2002 to produce some of the finest espresso coffee makers available today. The combination of their expertise has produced espresso machines that feature the utmost in internal quality and external beauty. If your a coffee-fanatic you’ll appreciate the quality of the Jura Capresso Espresso Machine offered in America by 1st In Coffee, the coffee company that “gets it”, we get it we know what coffee aficionados want. The Jura Capresso Impressa S9 Super Automatic is a dual thermoblock machine, with independent heating systems for brewing and steaming. It’s a large capacity and large volume automated espresso machine designed to see heavy duty in the home, in the office and could also be used for light duty in a small restaurant looking to offer espresso and cappuccino drinks. 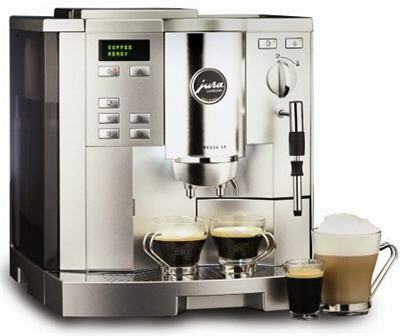 The Jura Capresso gives you more value and durability for your money, users insist that it is one of the best espresso machine on the market, it allows users to create true espresso coffee drinks with just the right thick crema that espresso lovers enjoy. At 1st in Coffee we feature only the very best espresso machines, coffee grinders, frothers and coffee makers, besides the Jura Capresso we also feature Super Automatics, Saeco, Rancilio, La Pavoni, Electra, Pasquini, Isomac, DeLongi, Francis Francis, Nespresso, Salvatore, Vibiemme and Cuisinart brands. 1st in coffee offers a 30 day guarantee, free shipping on espresso machines and coffee makers purchased over $50, lowest price guaranteed, sales tax not charged, except in New Jersey. 1st in Coffee also carries like-new refurbished espresso machines.